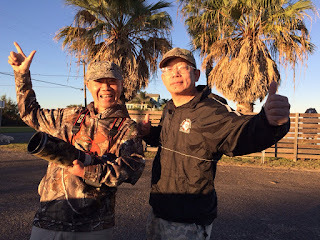 Philly Bird Nerd : Misses, Mud, and "The Chinese"
Misses, Mud, and "The Chinese"
After a fantastic few days of birding in Texas, we still had one or two birds on the target list including Ringed Kingfisher. 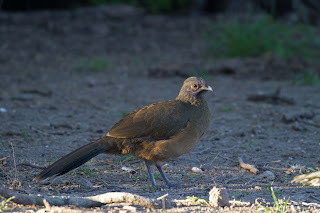 This is another one of those birds that is regularly found in Central America but rare in the U.S. I have seen a few on our various trips to Belize, Mexico and Honduras but not in the U.S. 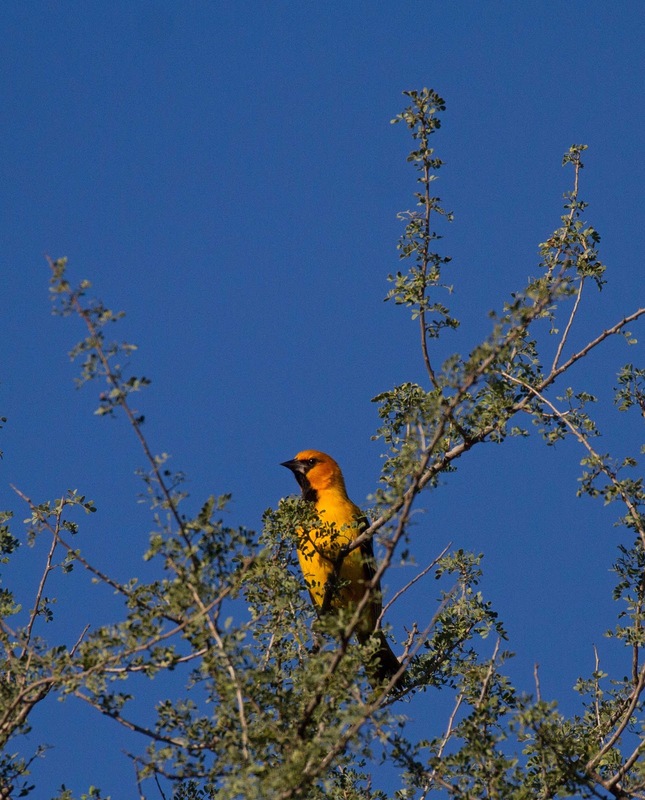 The bird is pretty regular in a few of the parks that border the Rio Grande river. Mary took us to one park on Saturday but we didn't see the bird. We started the day at Bentsen Rio Grande State Park. We were the second car in the parking lot. The other car was actually a van full of birders dressed in camouflage and carrying cameras with giant lenses. We found out that 2 were from China, 2 from Vancouver and 2 from Toronto - all Chinese birders on a tour of the US. After a grueling and practically birdless 5 mile walk, we struck out on finding the Kingfisher. We did find a few Altamira Orioles to photograph. 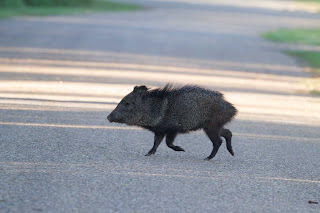 And found this Javelina wandering around the picnic area. He scurried away when he saw us. 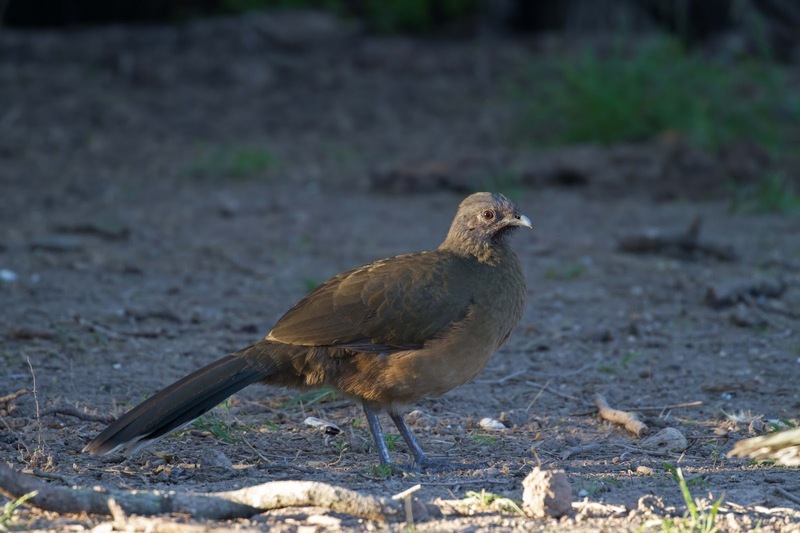 This is Plain Chachalaca. 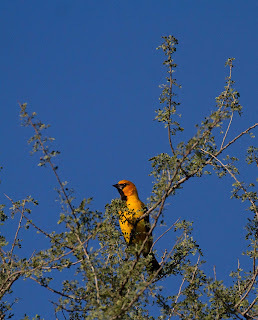 We saw many on our trip but they are usually skulking around under the trees in the shade. This one came out into the sun briefly. We struck out on the Ringed Kingfisher so we headed out to our next destination to see if we could find Mountain Plovers that had been reported in a farm field. 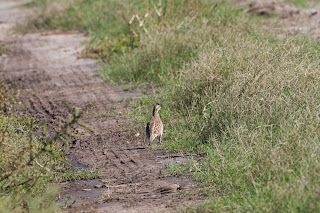 We searched and scanned and searched and scanned but not a plover in sight. The field was so large that we couldn't see the other side. The plovers must be there! So we took the Jeep and followed the service road. We were surprised to find a covy of Bobwhite! We also found a little patch of mud. The Jeep was stuck. A few pushes and the Jeep was free. Lori was a muddy mess. And we still couldn't find the plovers. Strike two for the day. Barbara had to be at the airport to fly to Denver so we gave up on the plover search and dropped her off at Harligen airport. It was a longshot, but Lori and I decided to head 2 hours north to try to see Whooping Cranes. Why not? 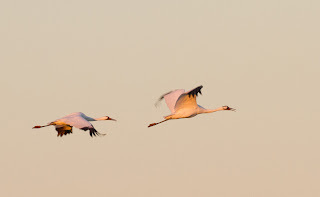 Whooping Cranes eluded us on our last trip to Texas. 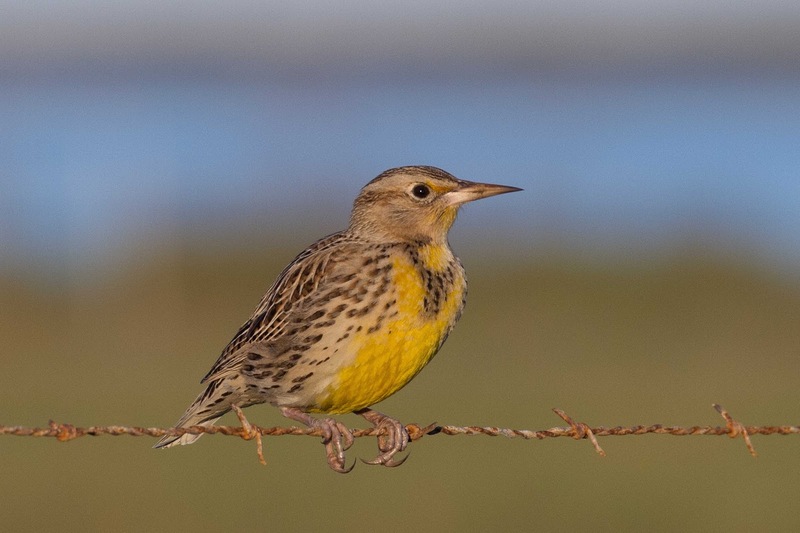 We showed up 2 days after they migrated north in April. Now, in November, we hoped to catch the first few as they arrived to spend the winter. Off we went in our muddy Jeep. The speed limit in Texas is 75 MPH and we were going faster to make it to Goose Island before sunset. We were passing a lot of cars and pickup trucks and one big van. Guess who was driving? The Chinese guy from this morning! We slowed down long enough to wave and then sped off again. We arrived at Goose Island in time to search the area for Cranes and found a few Sandhill Cranes which are gray, but no Whooping Cranes which are white. We drove to the Visitor Center to ask about the Cranes. The guy told us to look in the campground which was ridiculous so we headed back to the field to try again. Guess who we ran into at the parking area? Yup. The Chinese guys. They drove up to see the Cranes too. We laughed and chatted with them for a few minutes and then headed out for one more chance to save the day's birding. 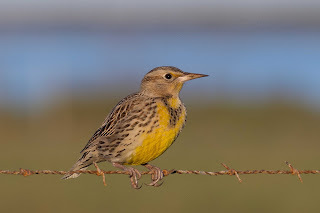 I spent some time photographing this very accommodating Meadowlark. And then they flew in - 3 Whooping Cranes! The Chinese guys came running up because they heard the Whooping Cranes calling as they flew in. The birds settled into the back of the field for a few minutes and then lifted off again. The lighting was perfect. We averted Strike Three for the day and everyone was happy! Here are our Chinese friends celebrating. If you are going to Conowingo Dam next week, look for them there. They are on a whirlwind tour.